Passages to the Past: Win a pair of Catherine Parr Siam Earrings! - Giveaway ends on June 21st. Thanks for the awesome giveaway-- I'm a follower! You don't need enter me - the goats would eat them off my ears - they are just lovely. Wow, what lovely earrings. Thanks for the generous giveaway. Wow! Gorgeous earrings! I just got the 4th season of The Tudors from Netflix so I will have to watch out for those earrings!! Beautiful earrings!! Thx 4 the chance. These earrings are so pretty! Thanks for offering such a great giveaway! I'm a follower of your blog (+5), follow you on Facebook (+3) and on Twitter (+3) and I tweeted a link to the giveaway (+1). I am a GFC, facebook and twitter follower. These are so pretty! Would be very exciting to win! Katherine Parr is my favorite of Henry's Queens, and these are lovely earrings and Henry's birthday is coming up 6/28...same as mine! Beautiful!!! I am a follower. Nice offer. Thanks. I'm a follower. What a nice thing to do! I'm a devoted follower....:) Many thanks to Sandra Byrd. Oh! I would love to win! 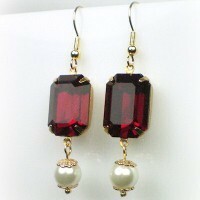 I love these earrings - very elegant. Yes, please. Love Sandra, love her work! These are beautiful!!! I would love the chance to win a pair! +3. Facebook follower (Colleen Turner). What a gorgeous pair of earrings that perfectly go with "The Secret Keeper" which I am most definitely looking forward to reading!! Those are just beautiful! And my little kids are finally old enough I'm starting to wear earrings again without fear of being pulled out, lol. +3 I'm a member of the Passages to the Past FB Page. Oooooo - what a fabulous giveaway! Please enter me in the drawing. My daughter would love these earrings. you can just imagine them in a Tudor ladies ear's. Beautiful jewels for a lady! Thank you for the wonderful giveaway! Wonderful giveaway, please enter me! So happy everyone loves them ... I love them too! Thanks for entering and for considering my book, The Secret Keeper: A Novel of Kateryn Parr! I love earrings, and these are beautiful. +5 I follow via GFC as Sandra K321. This is a fabulous giveaway. Thanks for the generous opportunity to win these gorgeous earrings. Wow beautiful earrings! Thanks for the wonderful giveaway! These earrings are absolutely amazing! I'm a huge fan of jewelry and the fact that they have a historical connotation is way awesome. I'm a blog, FB, and Twitter follower. I posted the contest on FB (A Bookish Affair) and on twitter (@abookishaffair).